As the weather starts to turn, it's time to start eating soup. What's also important is making sure you eat something raw (like salads) on a daily basis. I make my own stocks and then add a little of this and a little of that. Tonight I used Andouille sausage and a little ground beef from Prather Ranch. 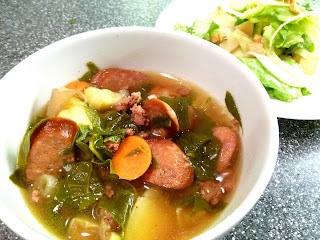 The beef helped soften the spiciness of the Andouille and the kids drank the bowl dry. Heat the stock to a simmer on low heat and add carrot and potato. Saute the sausage pieces until golden and put into soup. Brown ground beef and put into soup. Saute the shallot and garlic then put that into the soup. Let everything simmer together until the carrots and potato are tender, about 20-30 min. Add the chopped chard before ready to serve. Add salt to your taste. Tear the lettuce into bite sized pieces. 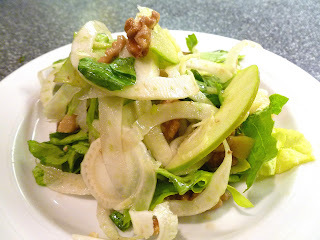 On a mandolin slice the fennel thin and then the quince and apples. Squeeze the lemon over the apples so they don't brown. Sprinkle the walnuts on top. Drizzle olive oil over top of salad. I usually take one pass over. Do the same with the sherry vinegar. Sprinkle with sea salt and then toss everything. I like my dressing on the tangier side so I usually leave it as is. Feel free to add more olive oil if you like it less so.